The Tree design screen can be entered via the F10 Key and is illustrated on the left. The top slider determines the type of tree to be created and repeated pressing of the F10 key will cause a new species to be generated. High, Medium, Low and Tiny resolution versions of each tree species are constructed and the radio buttons allow each of these to be displayed. The text area in the middle of the window displays information relating to each of the tree designs. The bottom part of the window allows the user to change the orientation of the tree. Type 9 : Tall with small branches spreading into a symmetrical crown. 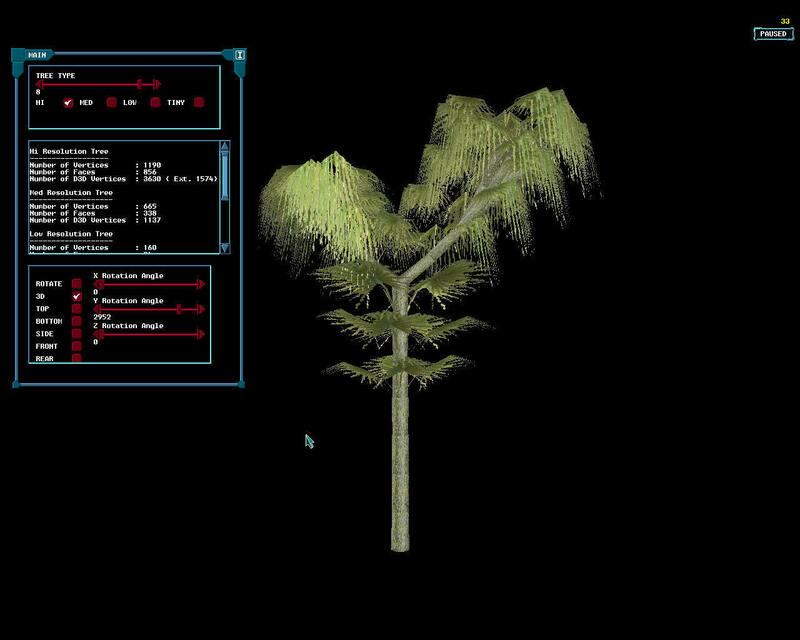 The texture map ( tree.bmp) used to describe the bark and leaves of the tree can be found in the textures directory. The polygon files used to describe the leaves can be found in the objects directory and the thumbnail image on the left indicates which texture corresponds to each of these files. There are three versions of each file that correspond to high, medium and low resolution models of the tree.